Unique design with the electric lifting and the lowering lever, both functions can be controlled easy and safe. The built-in charger makes operations more autonomy and increase the operating range. 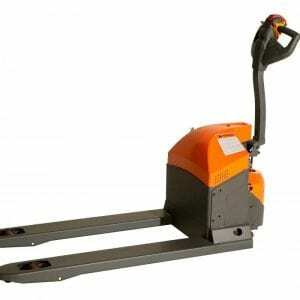 Additional entry rollers ensure easy pallet entry and preventing possible damages. Robust chassis with reinforced fork structure. 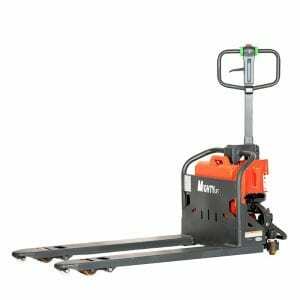 Sideways casters ensure traveling stability and safety in medium applications. The powerful 64Ah (2x12V) batteries gives enough autonomy the truck needs. Proofed and ergonomic emergency button and discharge indicator are more robust and reliable than others. The included automatic battery protection ensures high lifetime for the batteries. Suspension casters better with performance in overcoming obstacles, high traveling stability and less wear & noise. Motor and wheel protection out of robust metal. Also gives perfect foot protection.